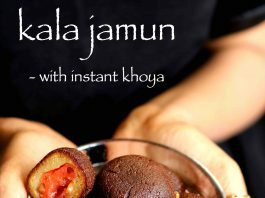 kala jamun recipe | black jamun recipe with instant khoya or mawa with detailed photo and video recipe. 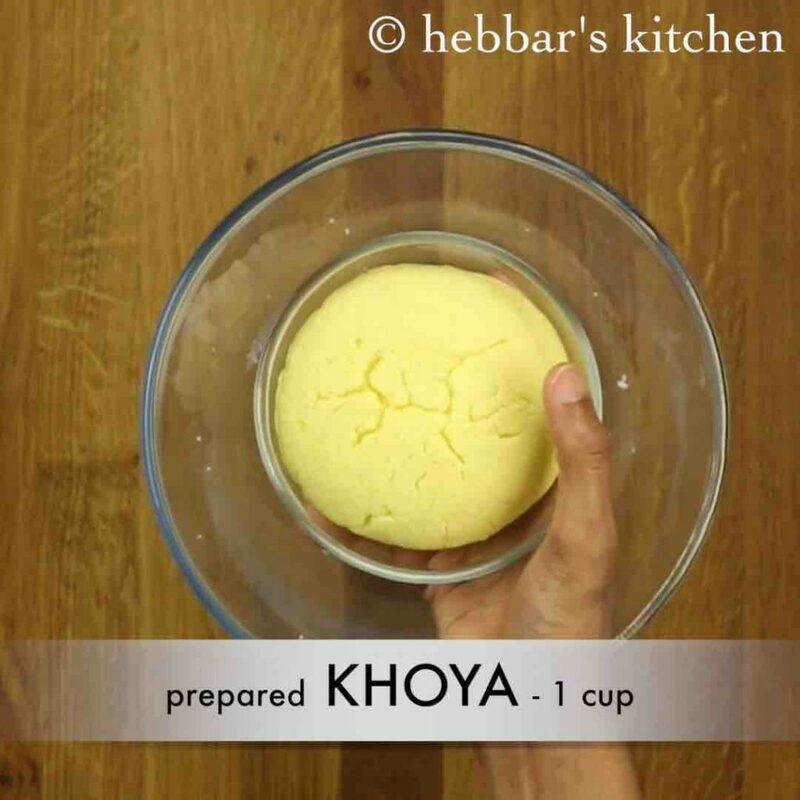 an exotic indian sweet recipe prepared with milk solid known as khoya or mawa. typically the gulab jamun or kala jamun is prepared with khova which is prepared by evaporated milk, but in this recipe instant mawa or khoya is prepared by milk powder. 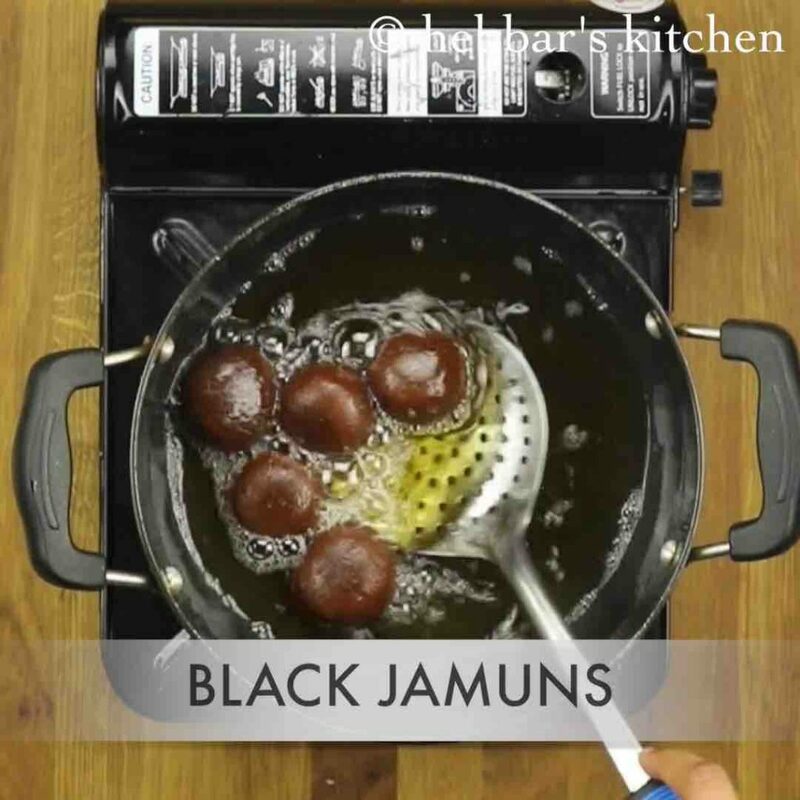 kala jamun recipe | black jamun recipe with instant khoya or mawa with step by step photo and video recipe. traditionally kala jamun recipe was considered shahi or royal and was prepared especially during festival, regional occasions or any special events. but these days it has it entered into domestic kitchens and has become a favourite meal ending dessert. 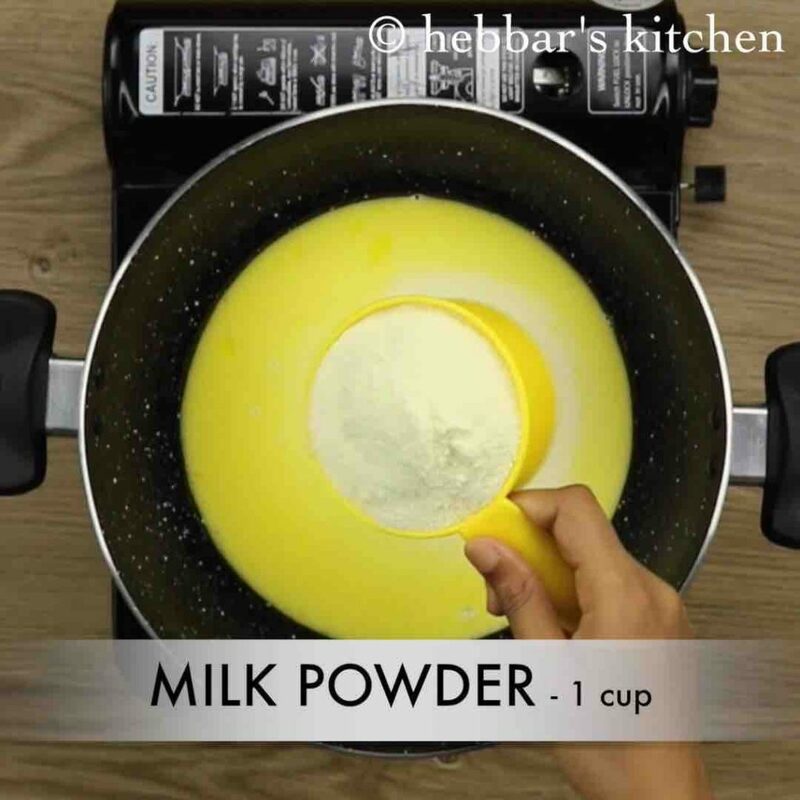 this can be easily prepared in milk powder or mawa or khova, but in this recipe it is prepared with instant khoya. 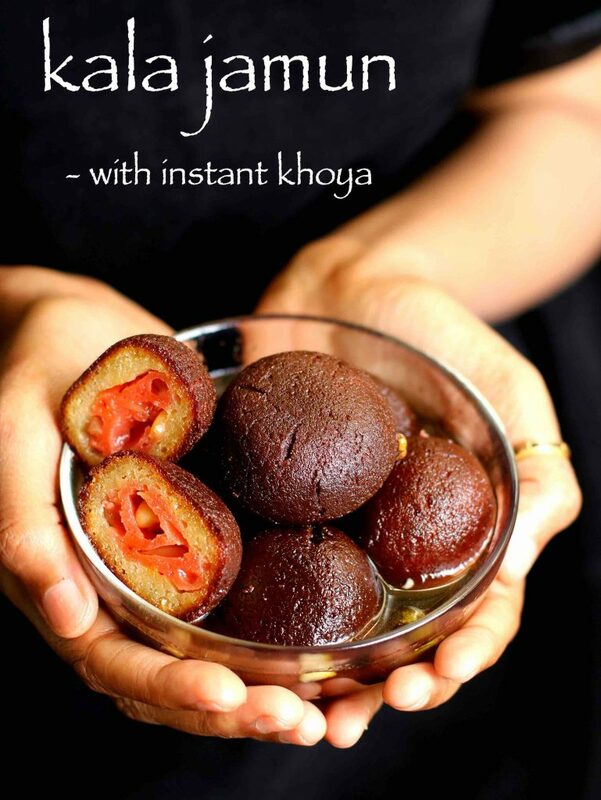 basically the recipe follows exactly the same procedure of any normal gulab jamun recipe. however the jamun’s are roasted till dark or black in colour or technically it is caramelized. previously i had shared the easy gulab jamun recipe with milk powder and even bread gulab jamun recipe. simultaneously i was getting several request for kala gulab jamun recipe and also for mava or khoya recipe. hence in this recipe i have clubbed together and prepared the black gulab jamun recipe. you can enjoy these dark gulab jamun with either vanilla scoop or butterscotch ice cream. 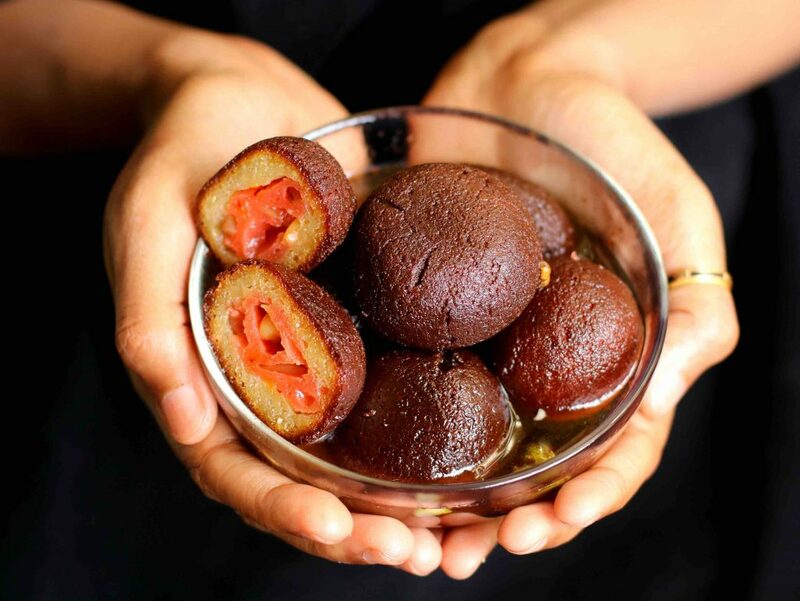 preparing these gulab jamu recipe is extremely simple with khoya or mawa, but some considerations before jumping into the recipe. firstly, jamun’s should always fried in low flame preferably in ghee. 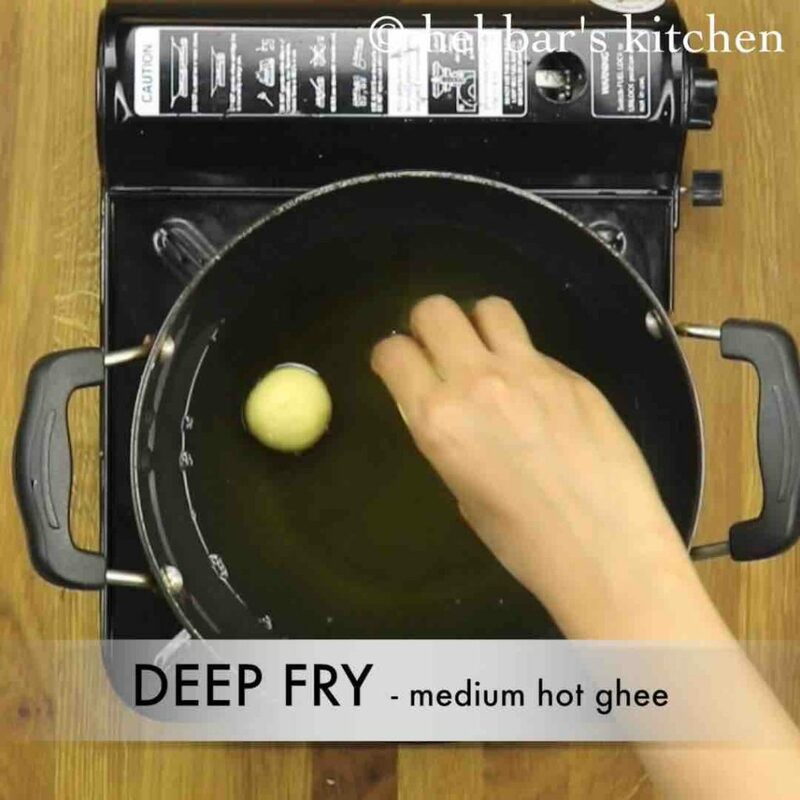 also, while frying avoid touching the jamuns directly and continuously stir the ghee so they change the positions. secondly, for a soft jamuns, dip them immediately in hot sugar syrup after frying. 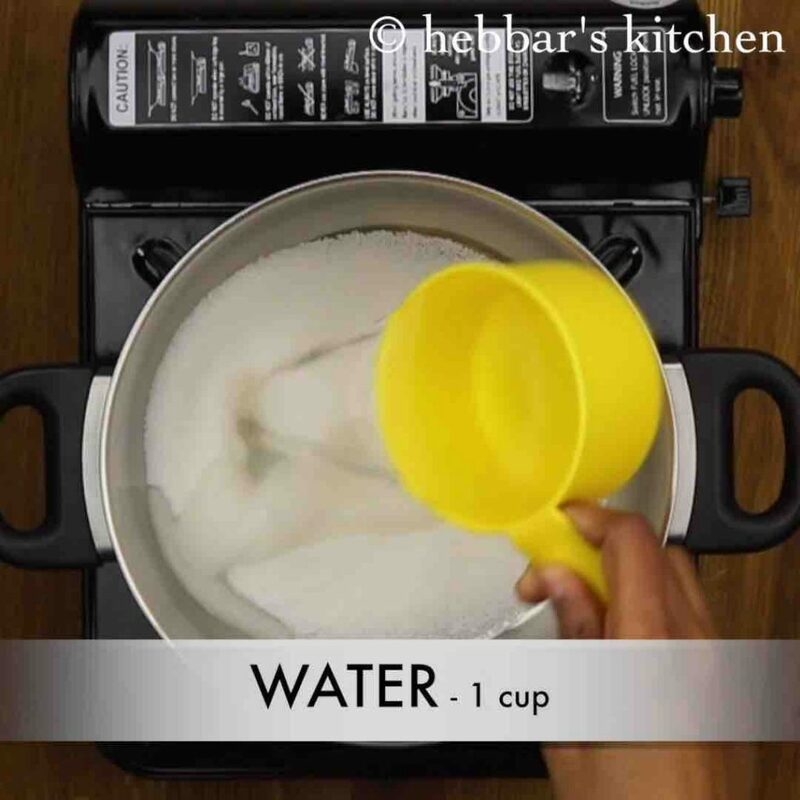 also make sure that sugar syrup is warm and not boiling hot. 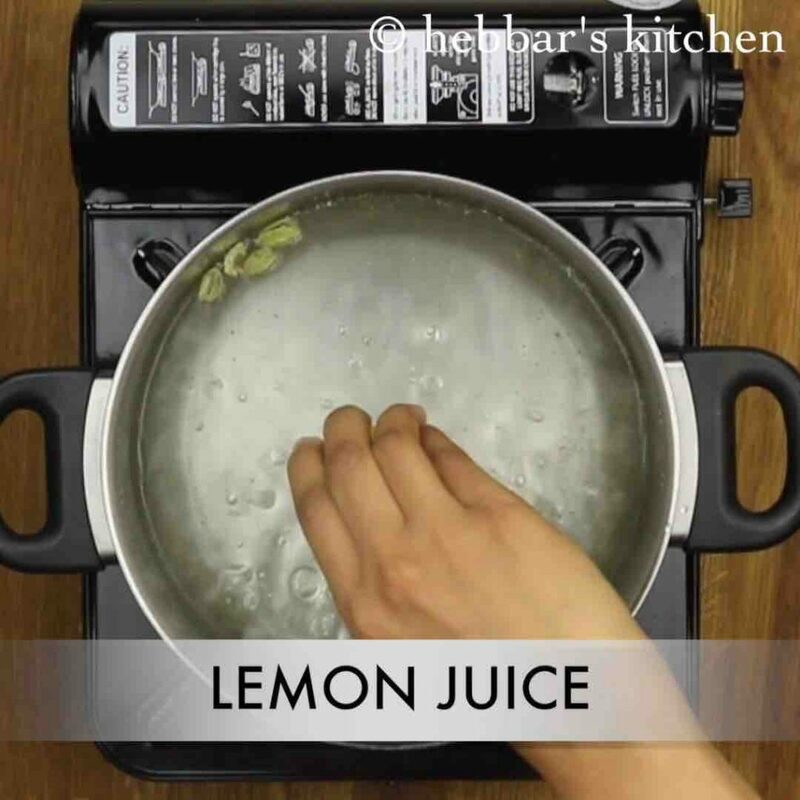 lastly, add some lemon juice to sugar syrup after the preparation so that it stops hardening of sugar. 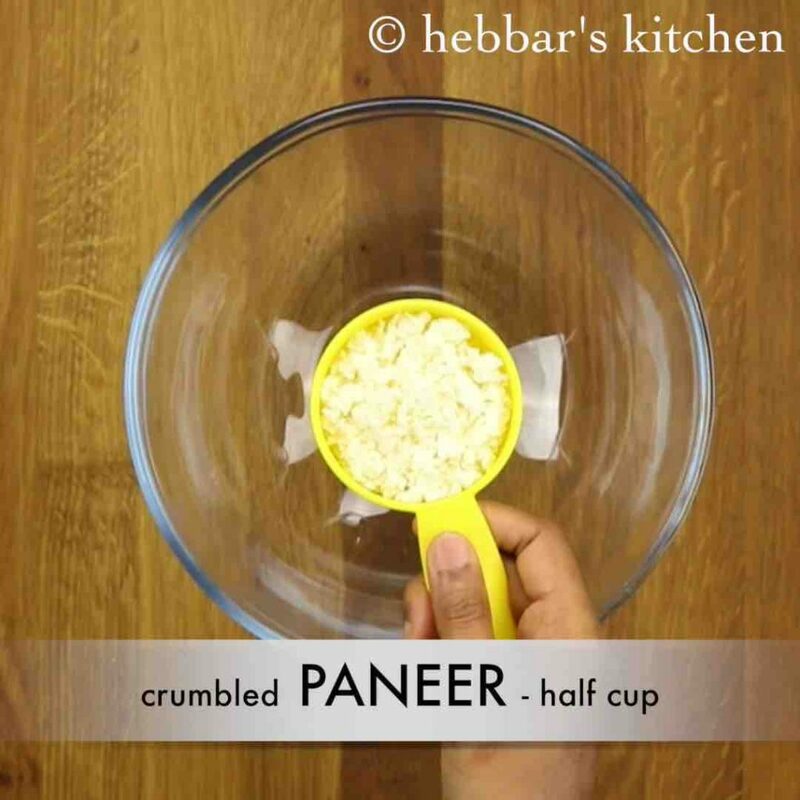 firstly, in a large mixing bowl take crumbled paneer. 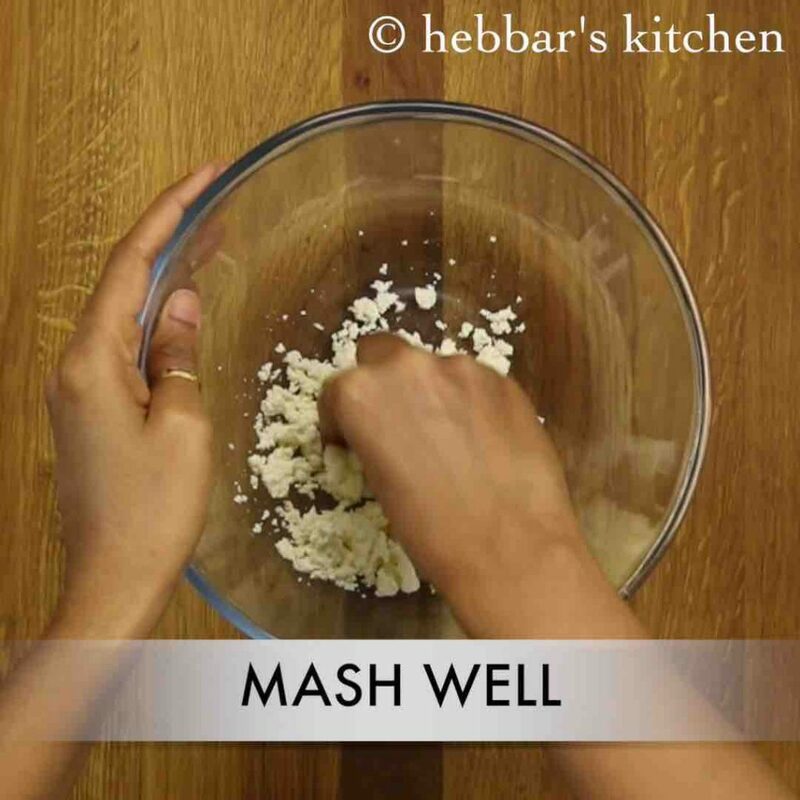 mash the paneer till it forms a smooth dough. 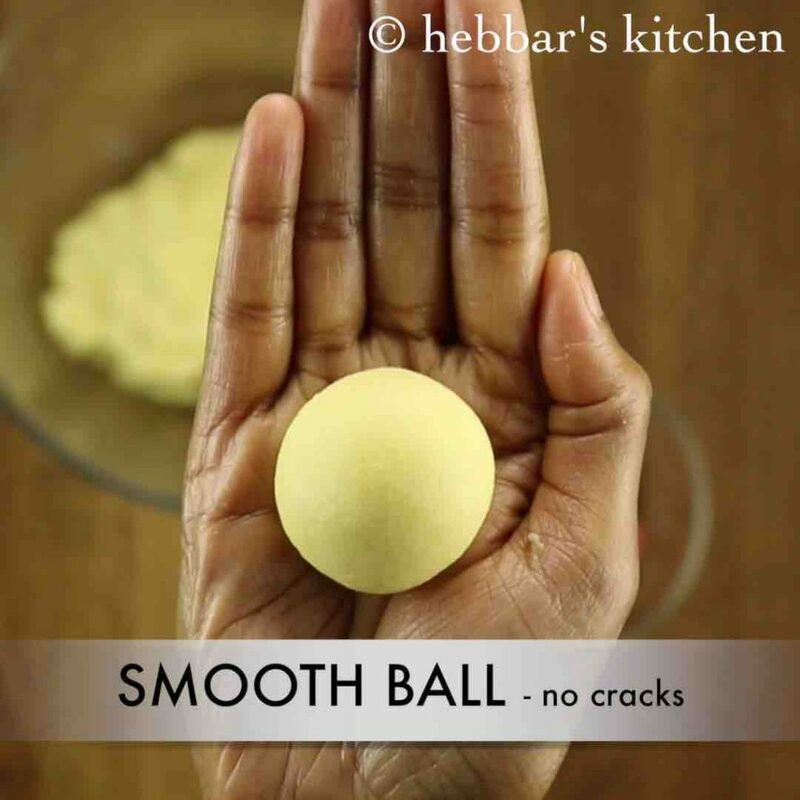 mash till the paneer forms a smooth dough without any paneer particles. now add prepared khoya and mash well. furthermore, add maida and combine with paneer khoya mixture. 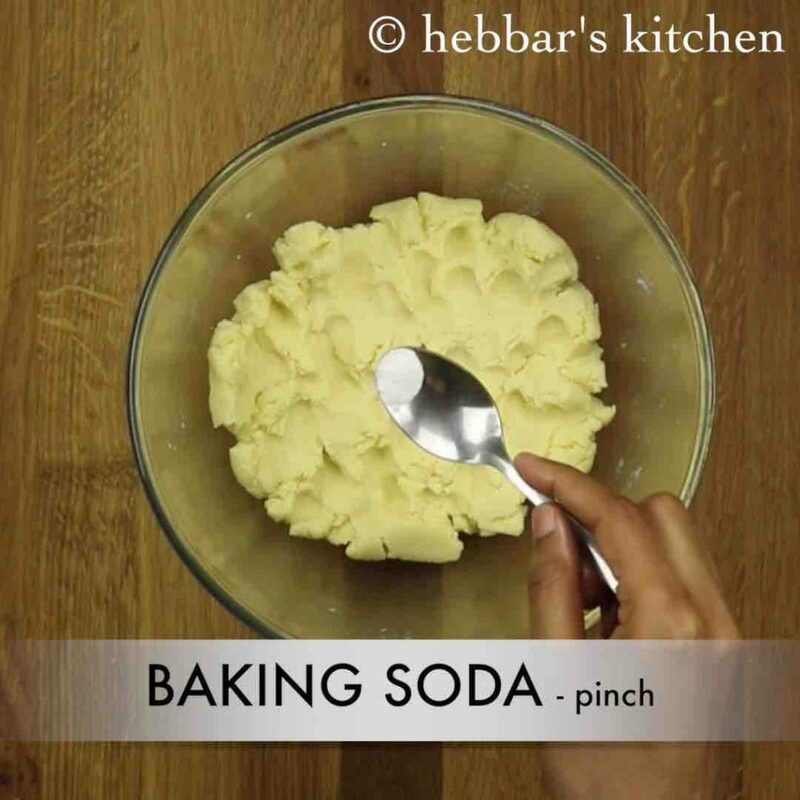 add a pinch of baking soda and water or milk if required to get moisture. 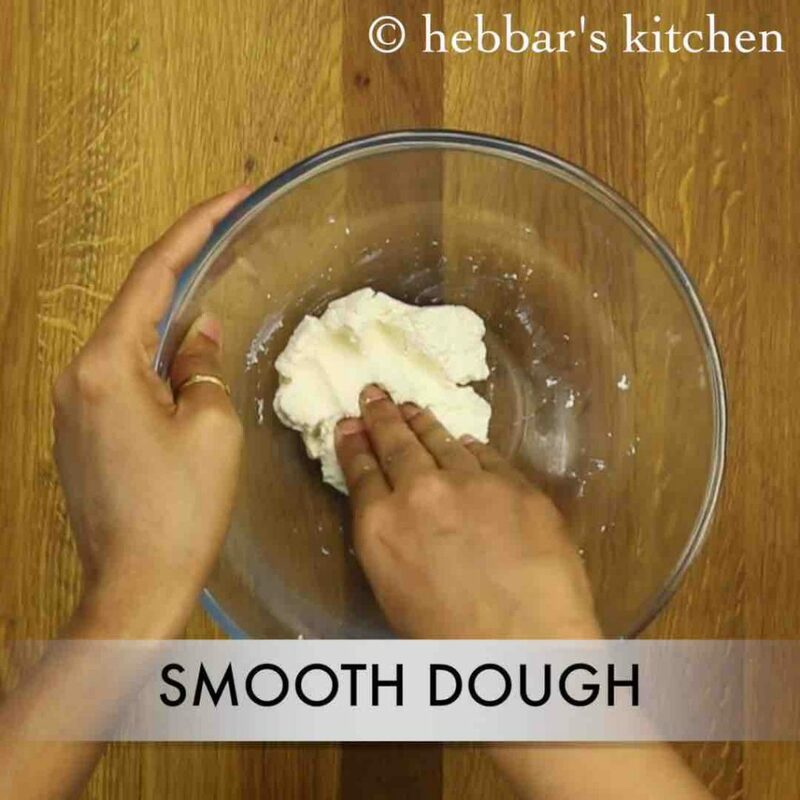 mix gently to form a smooth dough. 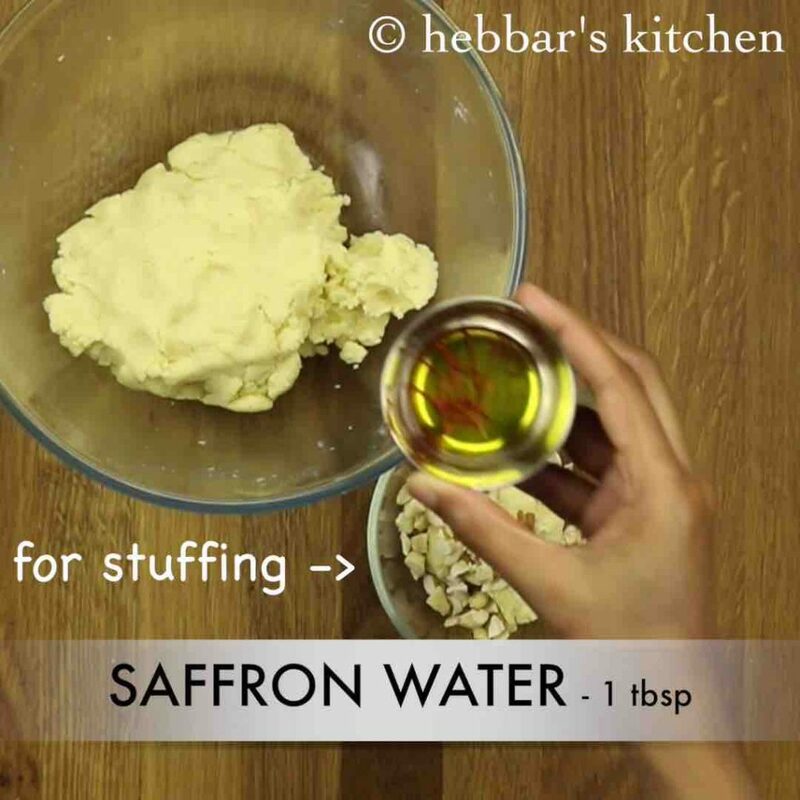 also prepare stuffing by mixing dry fruits and saffron water, colour with prepared dough. make balls. 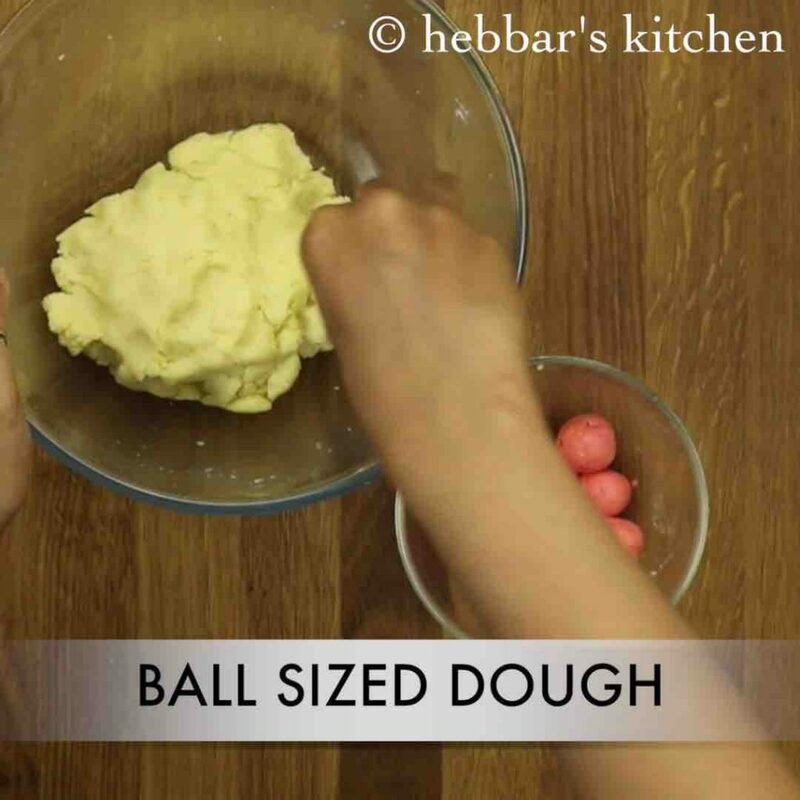 firstly, take a small ball sized dough and make ball. and place the prepared dry fruit ball in centre. cover and seal the ball. fry till the balls turns black. 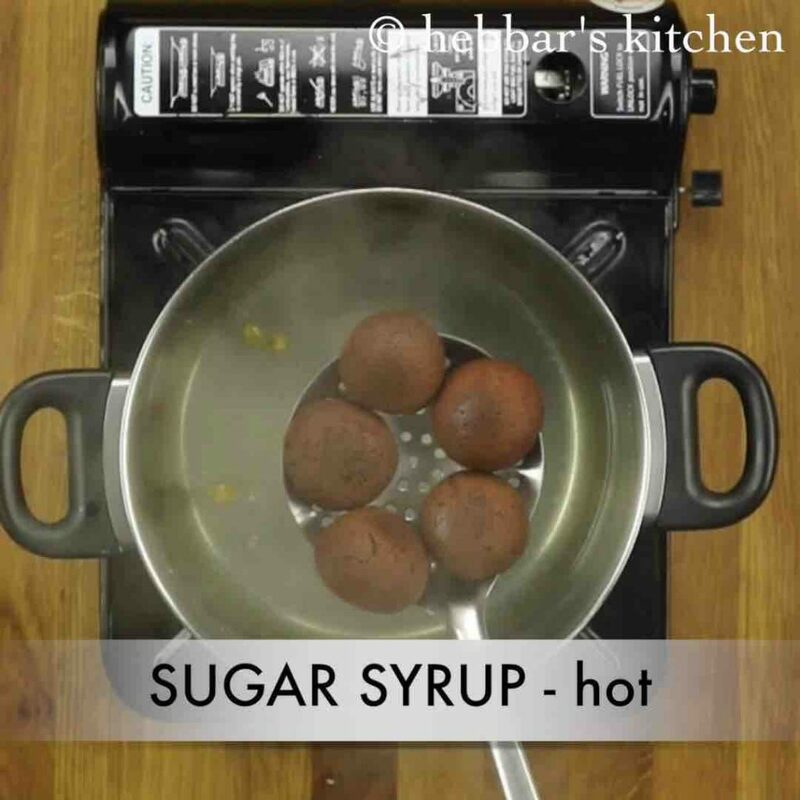 immediately, drop the hot kala jamuns into hot sugar syrup. finally, serve kala jamuns when doubled in size. firstly, in a large non stick vessel heat ghee. 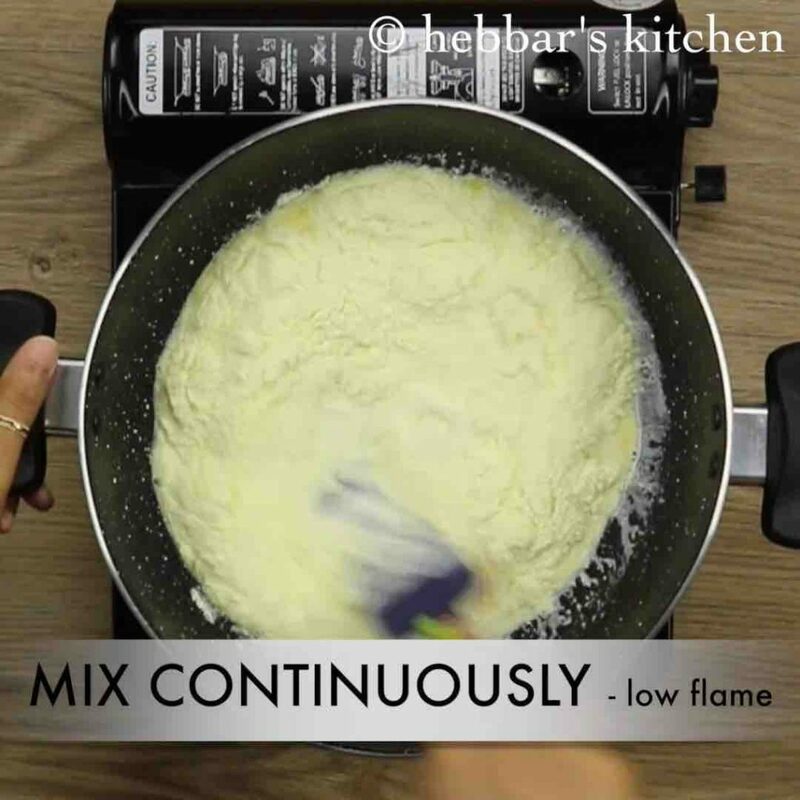 mix continuously keeping the flame on low to medium. 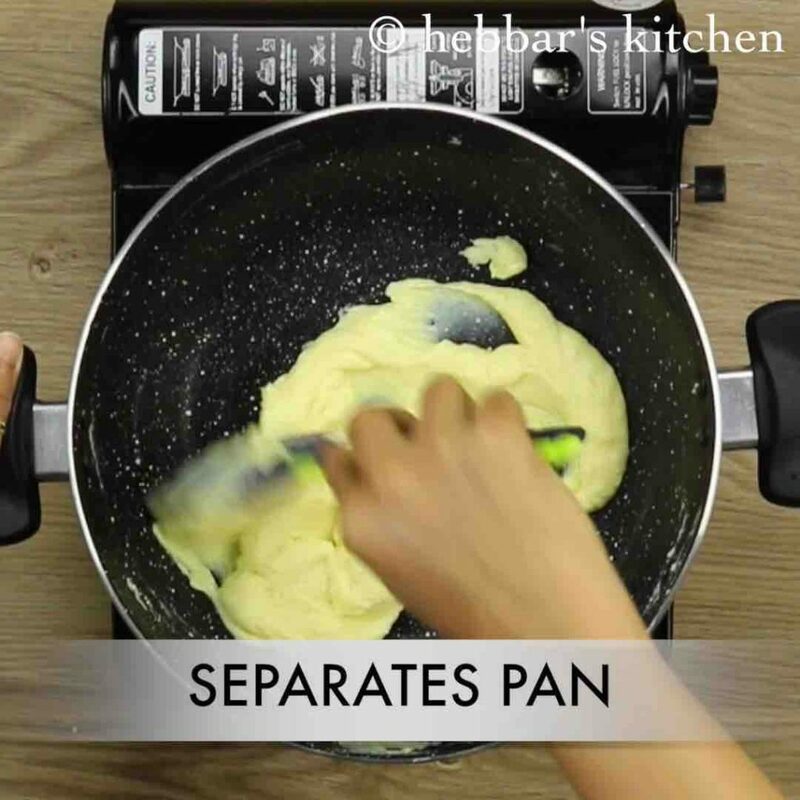 and also starts to separate from pan. mix till the mixture forms a lump. 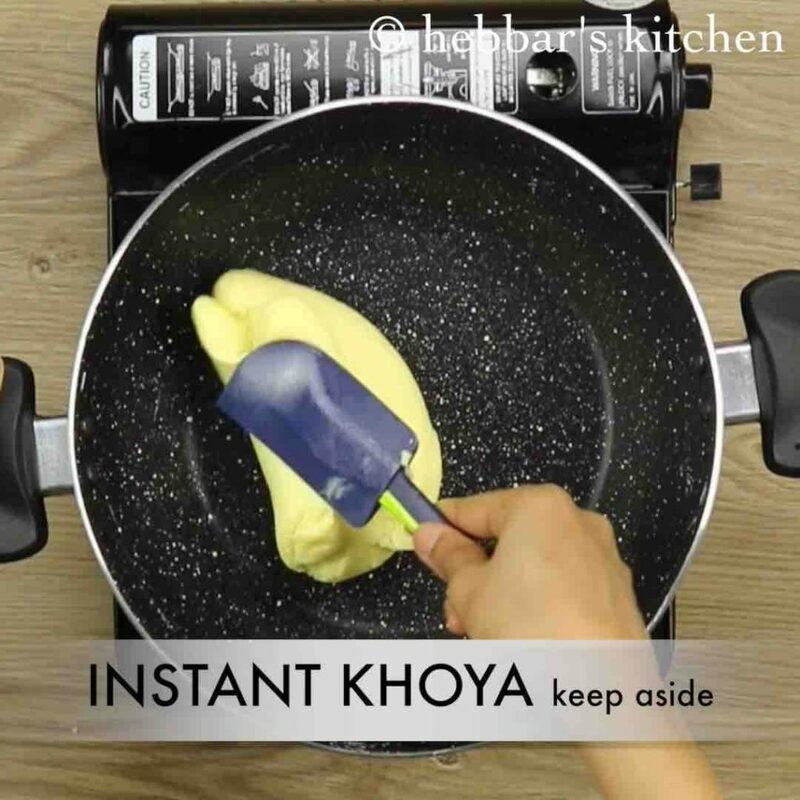 finally, khoya is ready. keep aside. 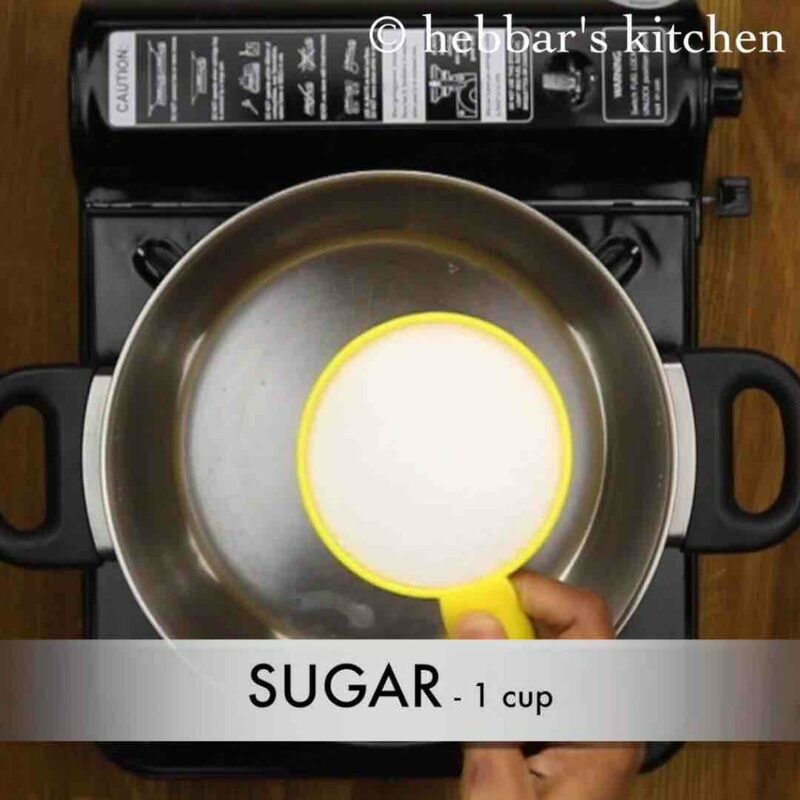 firstly, in a wide pan take 1 cup of sugar. further, to that add 1 cup of water and get to a boil. 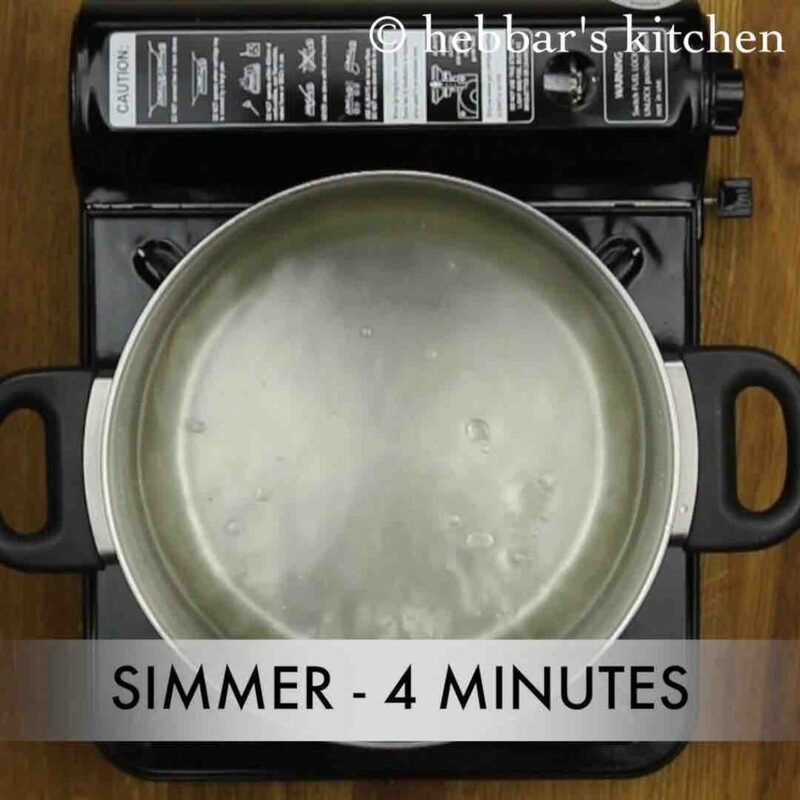 then simmer for 4 minutes till the sugar syrup turns slightly sticky. also add lemon juice to stop crystallizations process. 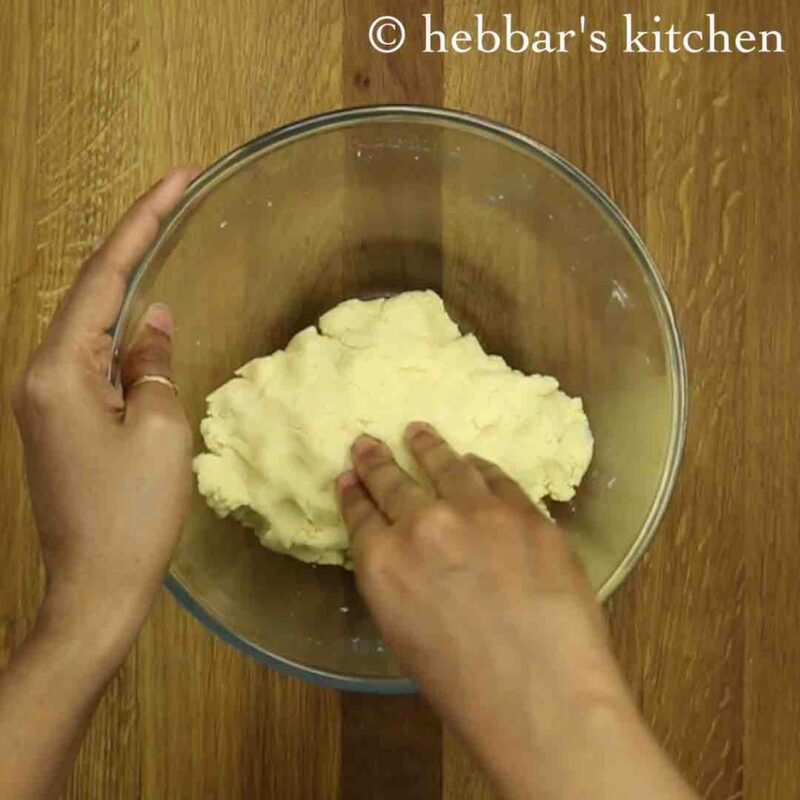 mash the paneer till it forms a smooth dough. 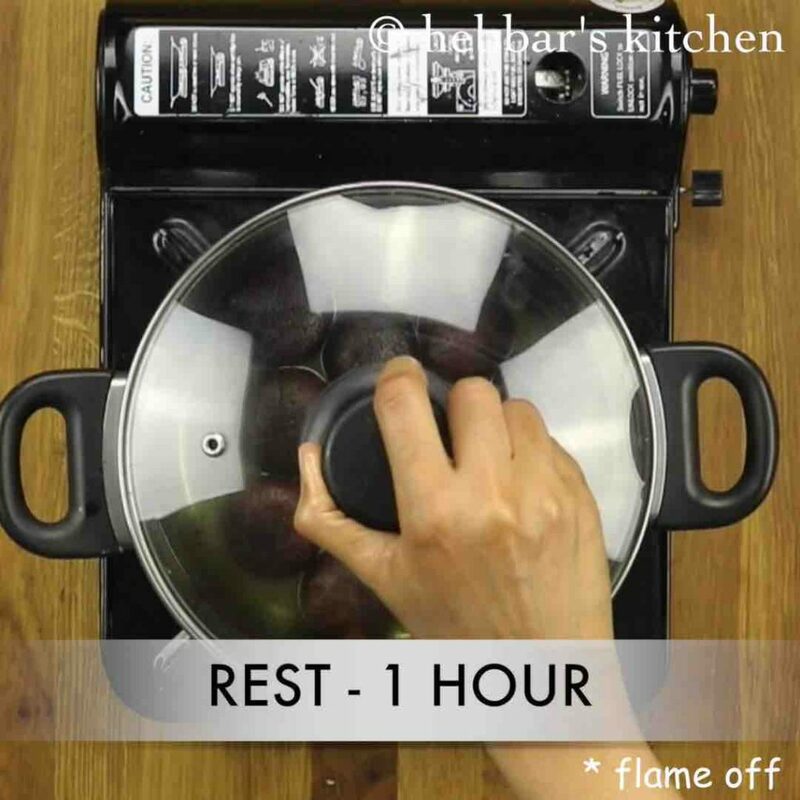 do not over knead as it releases oil and makes jamun hard. 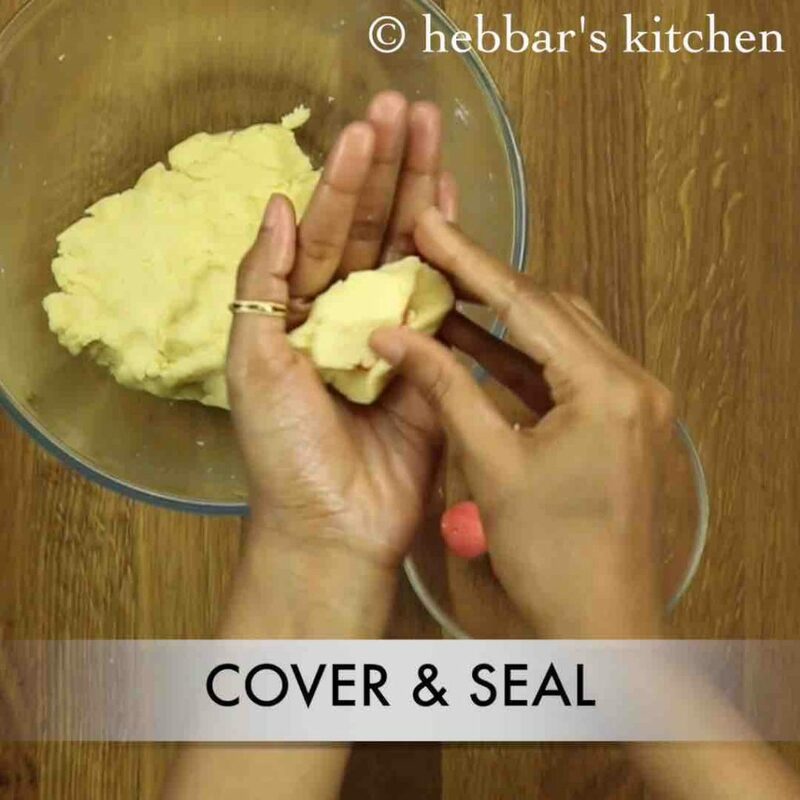 also form a smooth dough combining with paneer. 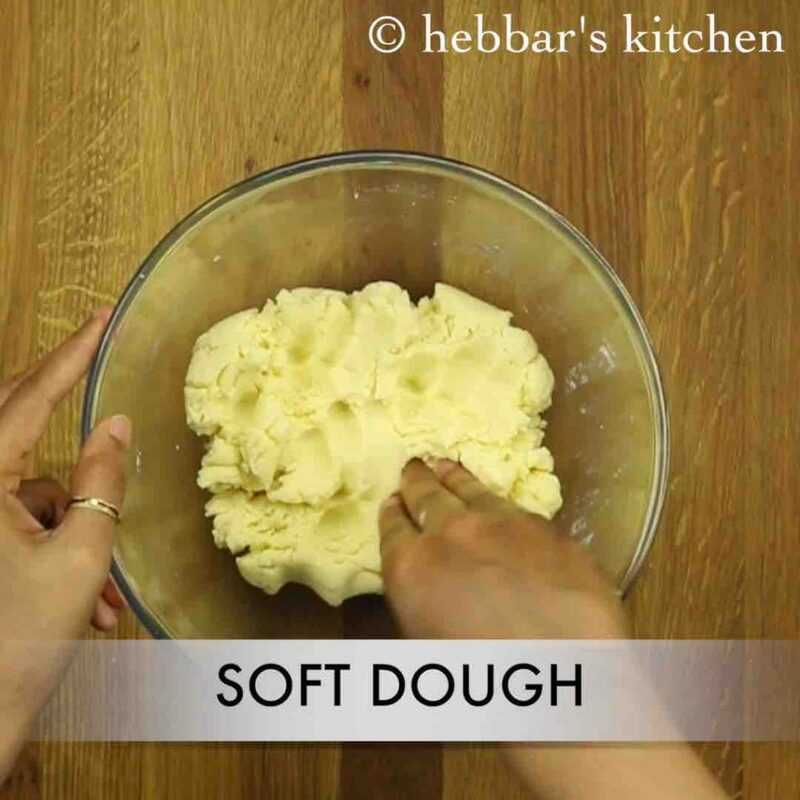 make a soft dough without kneading hard. 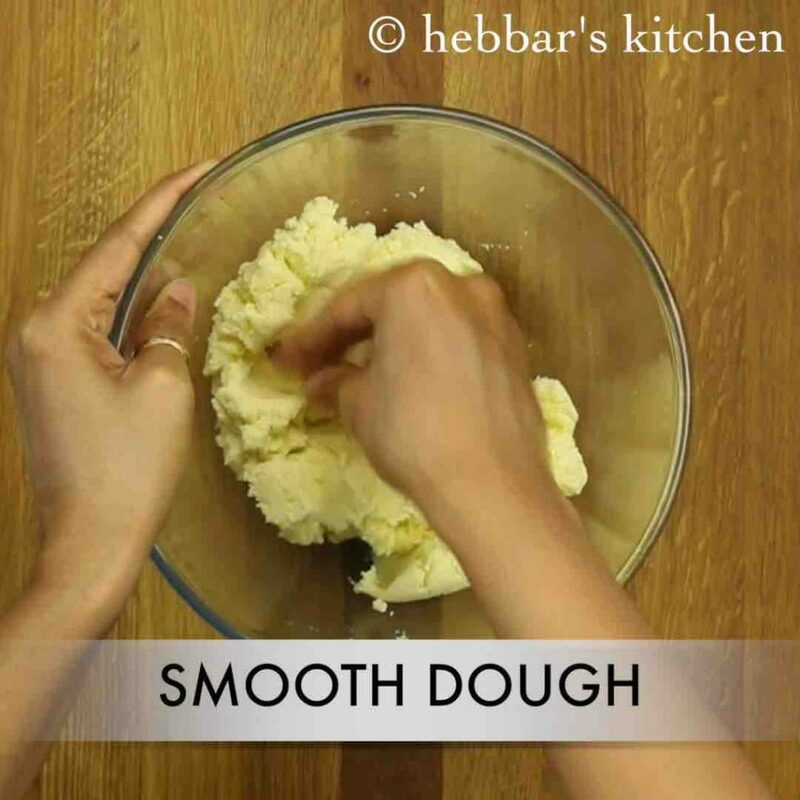 mix gently to form a smooth dough. keep aside. firstly, take 2 tbsp of prepared kala jamun mixture. add chopped almonds and cashews. also add saffron water and colour. mix well and prepare balls. keep aside. and place the prepared dry fruit ball in centre. 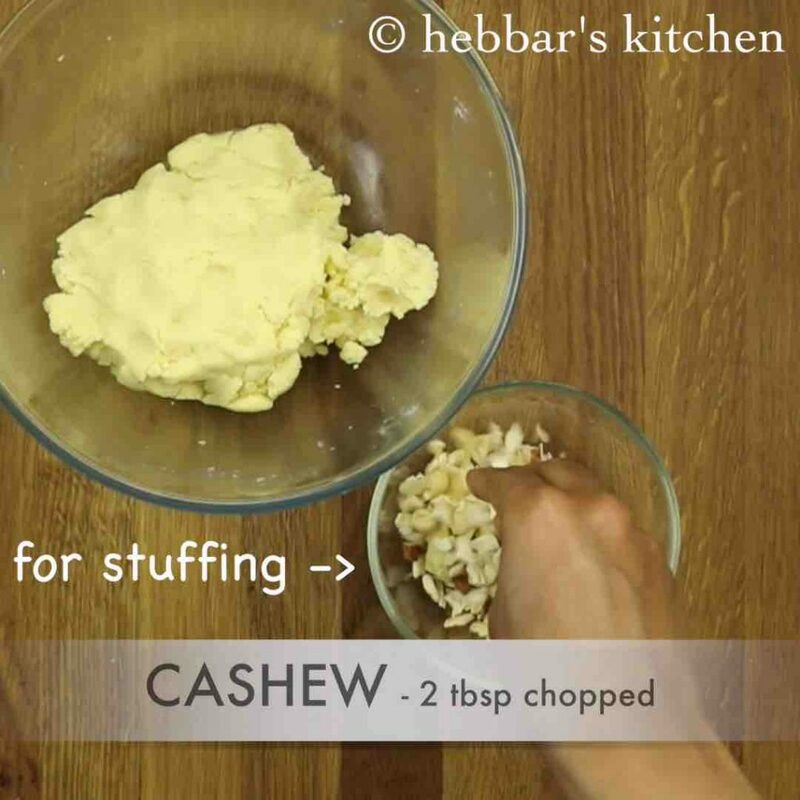 stuffing is optionals, but they give nice crunchy bites. 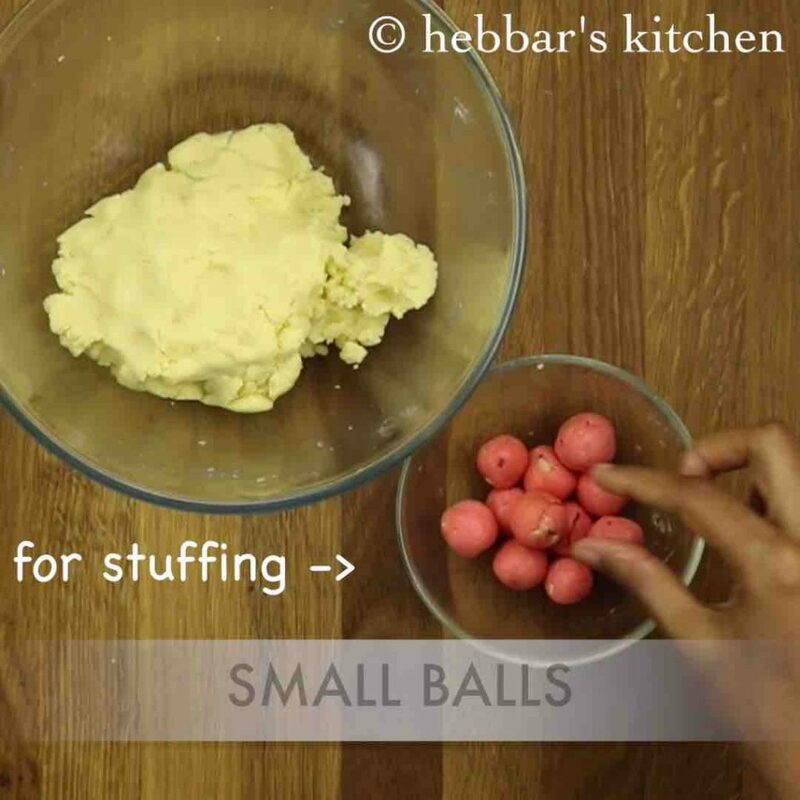 furthermore, make balls greasing ghee to hands. make sure there are no cracks on balls. else there are chances for jamun to break while frying. fry till the balls turns black. drain and keep aside. immediately, drop the hot kala jamuns into hot sugar syrup. else jamuns wont absorb syrup, results to hard jamuns. cover the lid and rest for 1-2 hours. flame should be turned off. finally, the kala jamuns have doubled in size. serve warm with ice cream or cold. 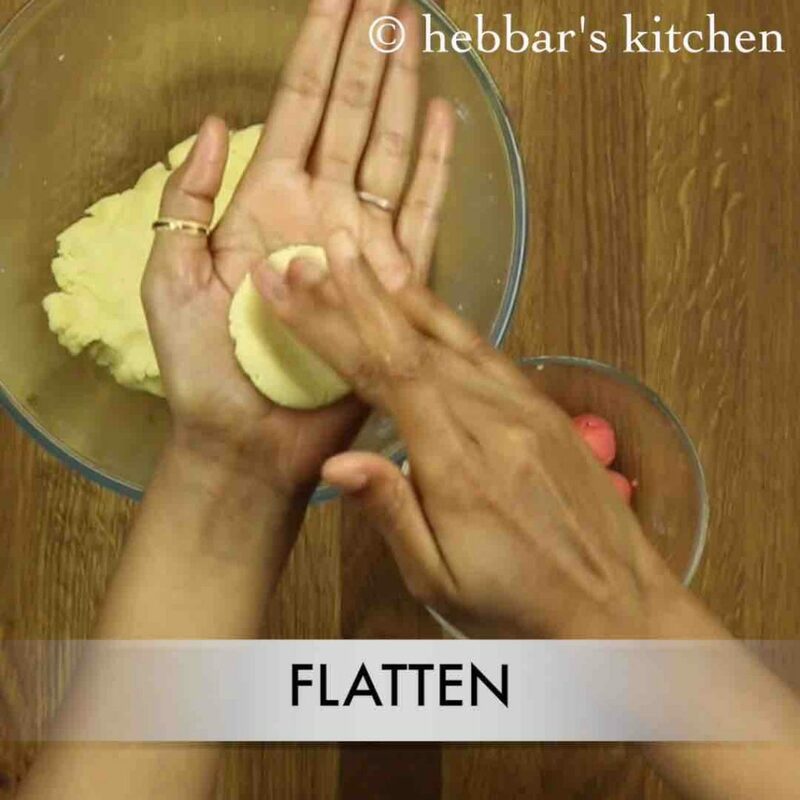 firstly, maida is binding agent so if the jamuns break while frying, add a tsp more maida and knead well. 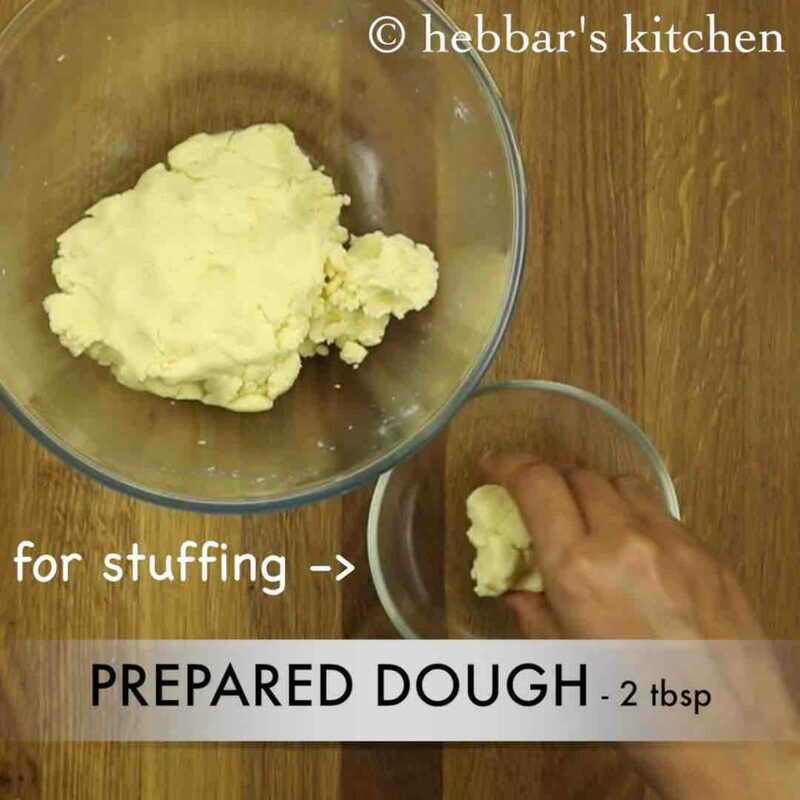 furthermore, make sure to knead smooth adding milk little by little. also, drop the hot jamuns into hot sugar syrup. else jamuns wont absorb syrup, results to hard jamuns. 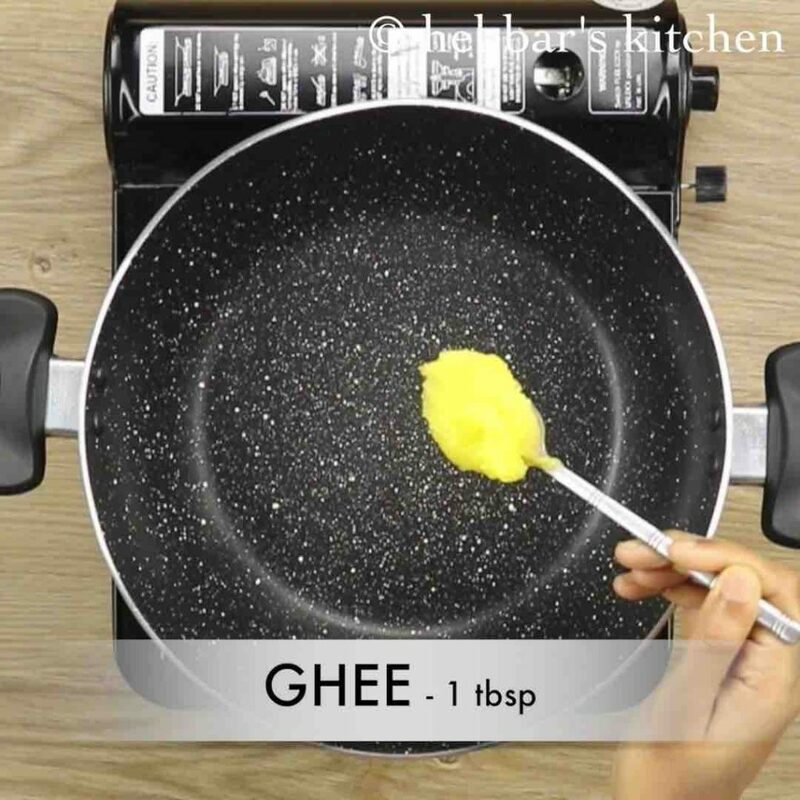 finally, grease your hands with ghee to make crack free kala jamuns. I really love ur all types of recipes and thanks for amazing delicious food..
can we fry in oil, instead of ghee? yes..but tastes great if you fry in ghee.. 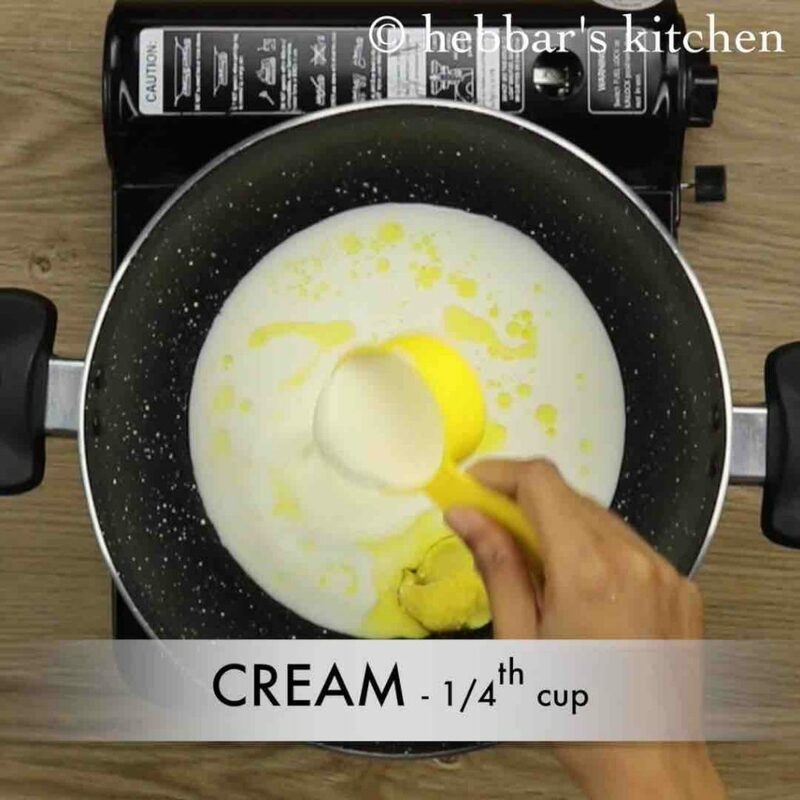 I followed your recipe first making Maa it says 1 cup milk powder and 1/2 cup milk however I did not use cream as it said optional. The mana turned out exact as it shows in the video but the finished product was not 1 cup mana a little less than 1/2 cup. Ur recipes are always good & delicious. Very helpfull in learning new. Mam please give me some ragi recipe for school tiffin box. 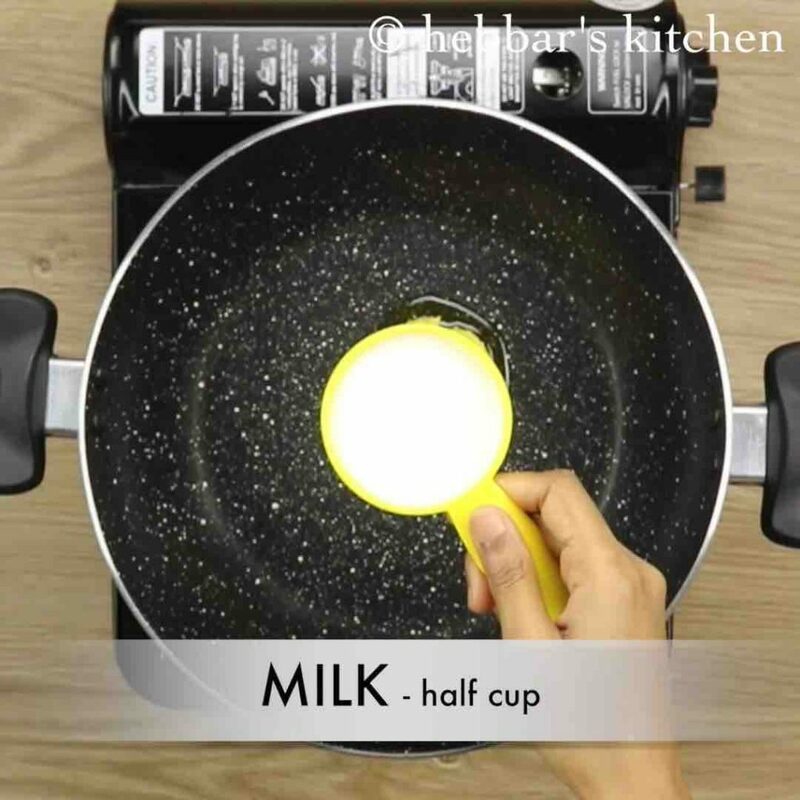 I have one question little off track….But I need help in this one…..U have used non stick pan …Can u tell me which brand ur are using to make khoya .I have one but all milk stick on bottom and it give burnt smell in my dishes specially when I make something related to milk. Please help me out ? I made kala jamun today, it came out very well! Thank u for the receipe. Hi, loved ur recipe and tried it but when I put the Jamun in oil they broke and turned powder in the oil .. any solution?? 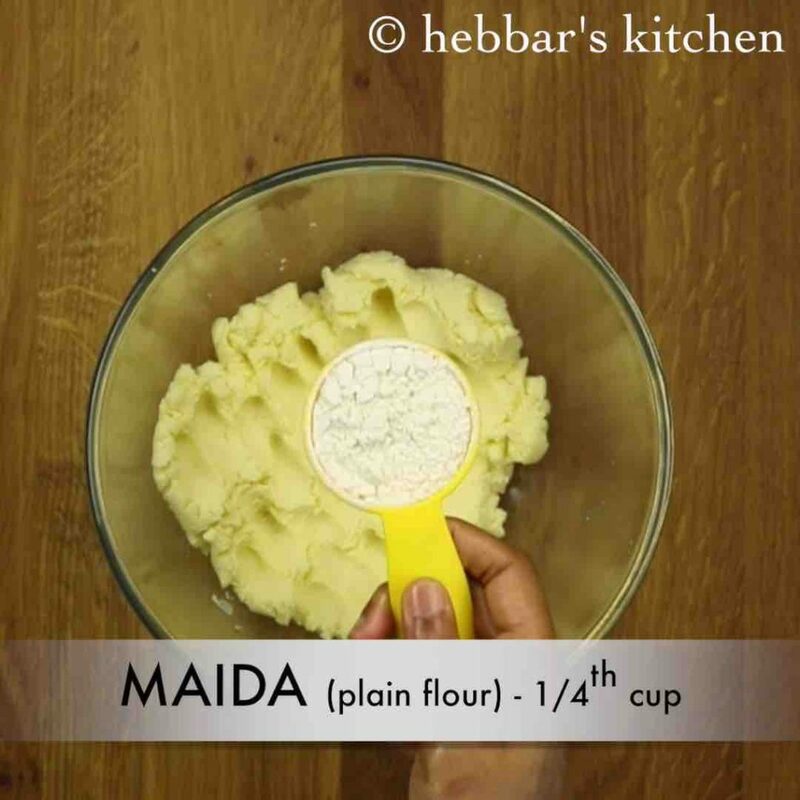 1) maida or plain flour’s quantity was less. 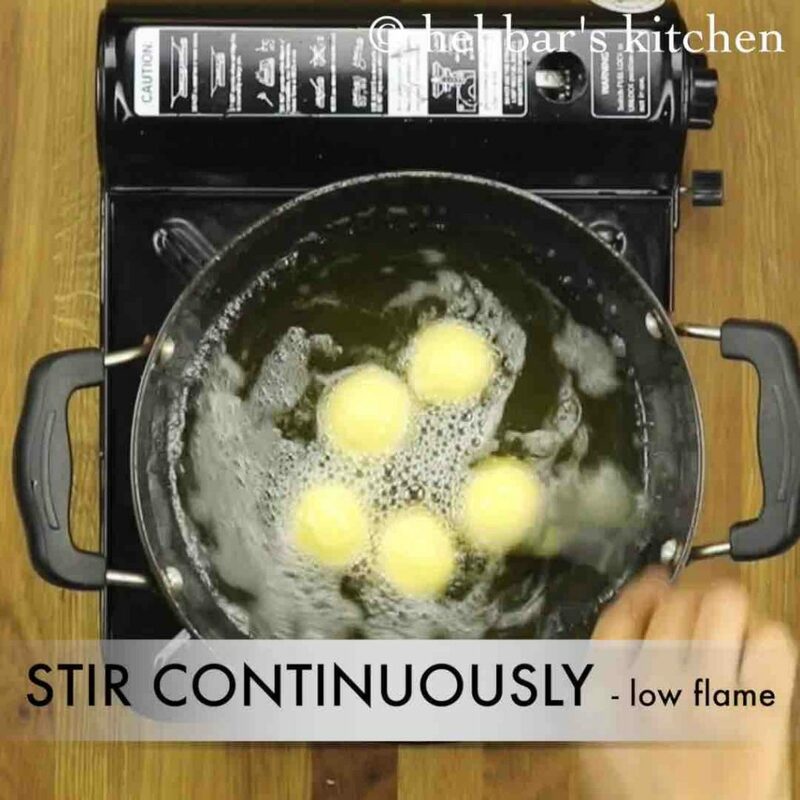 3) heat was high – always fry them in low to medium heat. After successfully making Rashgullah tried the kala jamun recipe; did everything the way it shows on the video and instructions the outcome was no way near as seen on the video. can you pplease let me know what was the issue?? where it went wrong? 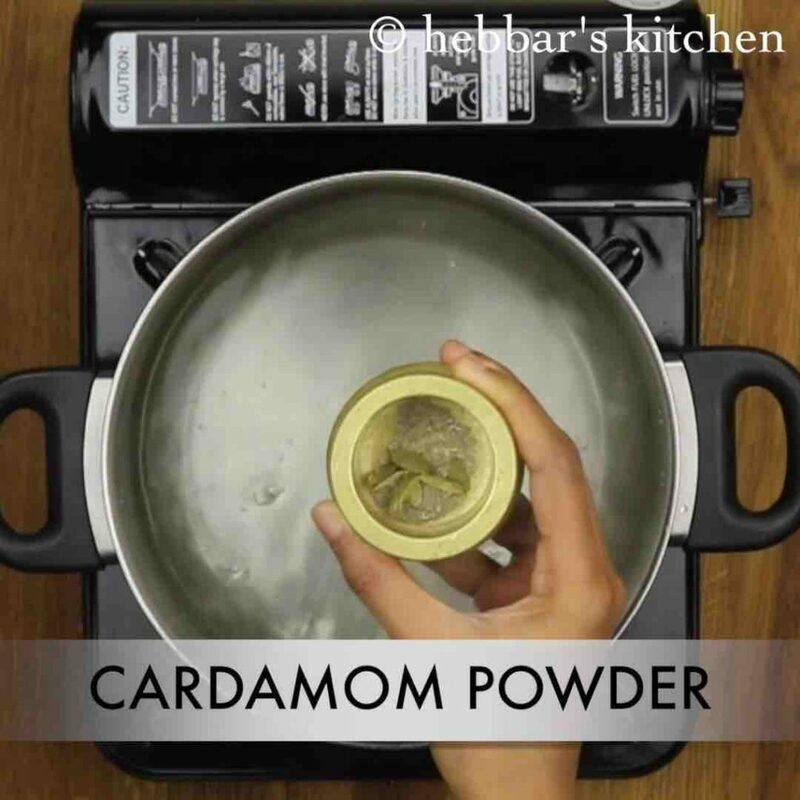 Thanks for the full proof Kalajamun recipe….it turns out perfect for the first time using your recipe this weekend. Just one question: If I add sugar with the dough itself ( for better- caramelized color after frying) should I use less intense sugar syrup? Thnks for the mouth watering dishes, I love cooking. 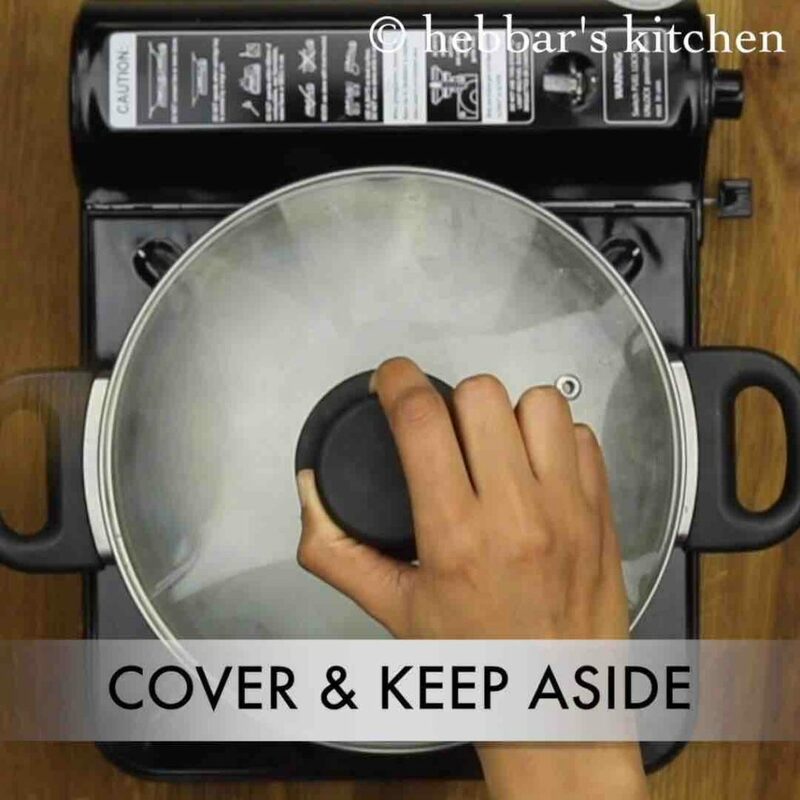 Can you show us how to make that soft and crunchy Davangere benne dosa? what else can be prepared with the syrup in case it remaines. Can I use MTR mix available in shops? yes certainly you can use MTR ready mix. wow…looks like a long process! but ill try it tmrw… what colour could I use? preferably which one??? thanks a lot Srivalli. You can use red or green colour if you wish. Thank you. 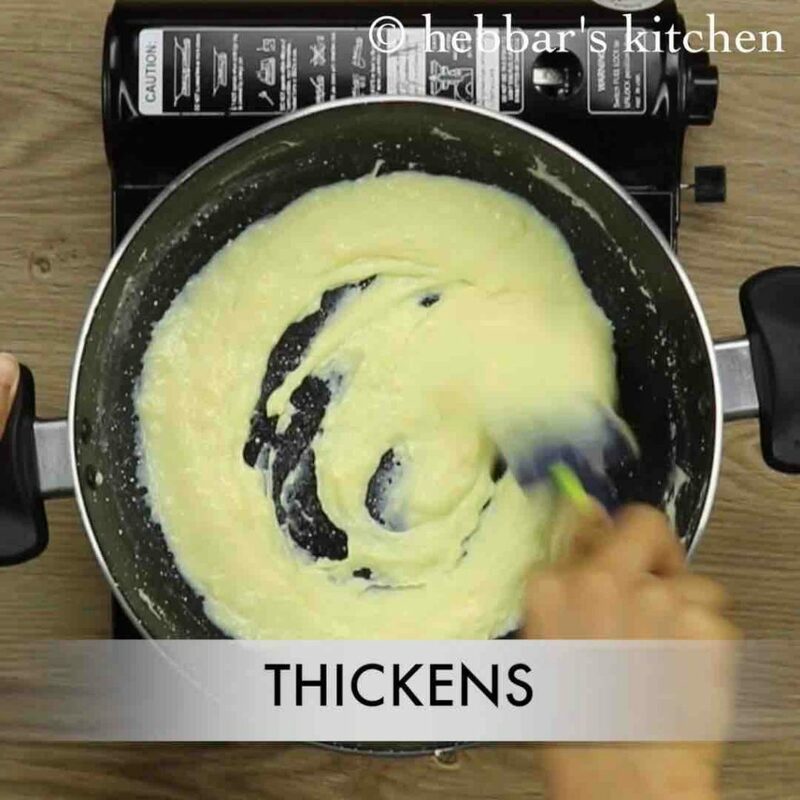 Your recipes are so good and easy to make. Can we use kova available in market directly without preparing it? yes certainly you can use store bought one.